If, within 7 days of delivery, you are not completely satisfied with your purchase, you are welcome to select another item or cancel your purchase for a refund*. All returns and re-selections are subject to a handling fee of twenty-five percent (25%) of the sale price. Merchandise re-selection or refund is available only if the original merchandise is returned in new condition. An inspection will be performed at the time of return. Please inspect your merchandise thoroughly upon delivery. Any damage or defect must be noted on your signed delivery slip and you must contact our service department within 48 hours of delivery. Depending on the severity of the damage, we will have the item repaired by our professional repair service at no charge to you; or, if the damage or defect cannot be repaired, we will arrange for replacement of the damaged piece. 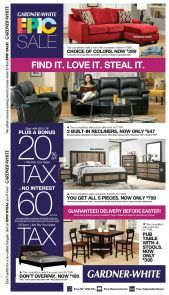 *The following items are non-refundable: bedding, special orders, floor samples, delivery charges, as-is merchandise, wood care, mattress protection, fabric protection and leather protection. For deliveries or shipments made outside our service area, any damage or defect must be noted on your signed delivery slip and you must contact our service department within 48 hours. We will arrange for replacement of the damaged piece. 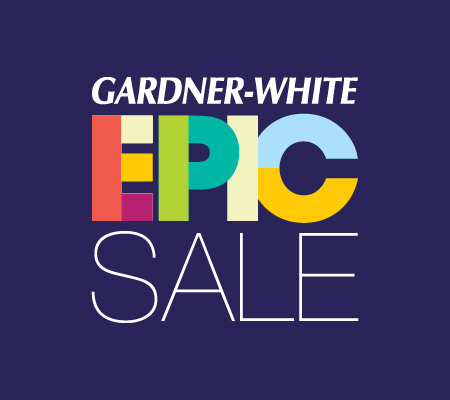 Be sure to thoroughly check your merchandise upon receipt, as Gardner-White will not be able to replace any damaged merchandise that is not noted on your signed delivery slip. For orders shipped via FedEx, the customer must report damage within the first 24 hours or Gardner-White will not be able to replace any damaged merchandise. If you wish to return any item for any reason other than delivery damage or defect, you must contact us within 7 days. Item(s) must be in new condition and you will be responsible for all shipping costs** via our carrier, as well as a 25% restocking fee. ** All shipping costs includes both the cost to ship the merchandise back to Gardner-White as well as the original shipping cost incurred by Gardner-White to deliver the merchandise to your home.